I know what you’re thinking, Snap is an unfortunate name for a BMX Company, especially when it comes to crank arms. Over the past year, I’ve broken numerous alloy cranks doing tricks. I can’t even remember how many crank arms and bottom bracket spindles broke on me, resulting in more money being spent on replacements. Now, I’m not advocating the Snap Series 1 Cranks for freestyle riding that involves gaps, drops and stairs, but for regular riding and everyday commuting, the Snap Series 1 cranks offer a great alternative to the Sugino RD cranks. Unlike the Sugino cranks, these are machined in the USA, California to be exact, from 7075-T6 aluminum. Their pricepoint is reasonable when compared to their inherently weaker (because of the forging process) counterparts. 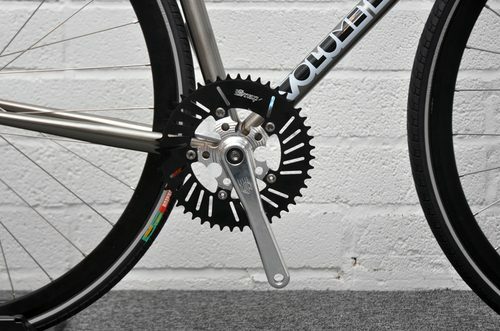 Not sure what the wholesale is on the cranks, or what wholesale is on Sugino RDs, but maybe these would be a good substitute for a single-speed or fixed project. The only issue I can see is the 110 bcd. Regardless, there’s a lot to be said about the length options and if they’re machined in the USA, maybe they would consider a 130bcd? or a 144bcd? No idea. I know of a few NYC-local shops, along with Tokyo Fixed Gear in London, who have been using these for single-speed and fixed builds with no issues. Check with your LBS and see if they carry them. if they don’t, hit em up! You can’t go wrong with the black or silver pairs.